Five Premier League sides are included in the top 10 football rich list released by Forbes. Real Madrid and Barcelona are the only two Spanish La Liga sides in the list of top 10 most valuable teams in the world and occupy the best two spots on the ladder. Manchester United are third, Bayern Munich fourth Manchester City fifth; Chelsea, Arsenal and Liverpool are sixth to eighth respectively. 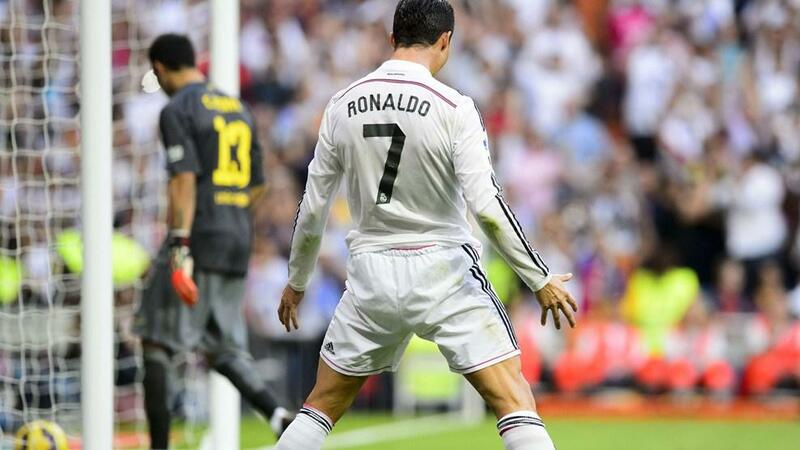 Cristiano Ronaldo Celebrates Scoring a Penalty Against Barcelona. Image: Getty. The Italian giants cling onto a place in the top 10 despite a fall in valuation, and ongoing struggles on the pitch. The Champions League semi-finalists pip AC Milan to the title of richest Italian club, helped by three (about to become four) successive Serie A titles. Liverpool are the lowest ranked English side in the list, but have benfitted from a return to Champions League football. Chelsea’s value has enjoyed a healthy increase this year, taking them above their London rivals Arsenal. City continue to prosper financially under the backing of the wealthy Sheikh Mansour. The fan-owned model seems to be working for Bayern, whose value has gone up by 27% over the last year. United are the highest-ranked English club, and the club’s deep reserves have led to speculation they’ll make a £100 million bid for Gareth Bale this summer. Despite a 5% decrease in value, Real Madrid top the list for the third consecutive year. Who will be the Galactico on the club’s shopping list this summer then? Suarez Appeared to Have Bitten Ivanovic’s Arm in a High- Tensioned Game at Anfield.